Sitting in the back seat, Cole asked the officers for an explanation for the stop, if they weren't being profiled. Their response was that he matched the description of a suspect they were looking for. After being asked for his ID and ordered him out of the car, Cole lost his temper. The next thing you know, he wound up on the ground with a pistol to his head. And the bigot with a badge in control of whether he lived or died yelled, “What you looking at boy?” before callously pulling the trigger. By contrast, Derek is interested in mounting a traditional protest, like a Black Lives Matter march. After all, he has no confidence Joe will be able to find any followers, especially since blacks are so brainwashed they mostly kill only other blacks, not whites. The ensuing debate of how to respond to Cole's untimely demise sits at the center of Black, a thought-provoking morality play written and directed by David J. Buchanan. Besides the badinage between the buddies, the film intermittently takes a break from the drama for brief, revealing tete-a-tetes with real-life black folks about their first encounters in life with the cops. 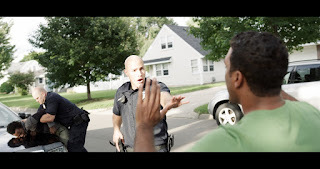 The heartfelt recollections shared in these mini-documentaries combine to paint a widespread pattern of discrimination and abuse on the part of the police.